Myrrh is mentioned as a valuable trade item in Revelation 18:13. John listed myrrh as a commodity no one would buy after Roman fell. The myrrh plant is one of the last plants listed in Revelation; yet reference to myrrh began early in Bible history. In Genesis (37:25), Joseph was sold to Ishmaelites who included myrrh in their trade caravans. Myrrh was a component of the anointing oil used in the Tabernacle (Exodus 30:23). Esther (2:12) completed a 12-month beauty treatment, which included myrrh, before she was taken to King Ahasuerus (Xerxes). Myrrh perfumed the robes of a king (Psalm 45:8) and the bed of an adulteress (Proverbs 7:17). Myrrh was catalogued seven times in Song of Songs to describe the Lover, the Maid (Bride), and Solomon’s gardens. Christians associate myrrh with the birth of Jesus (Matthew 2:11). The wise men who traveled from the East to Bethlehem offered Christ gifts of gold, frankincense, and myrrh. By tradition, gold symbolized Christ’s kingship, frankincense his deity, and myrrh his death. Myrrh was present at Christ’s burial. Following the crucifixion and death of Jesus, Joseph of Arimathea and Nicodemus wrapped Jesus’ body in linen perfumed with about 75 pounds of myrrh and aloes (John 19:39). Then, they laid Jesus’ body in a tomb carved in rock. The Israelite myrrh plant is the Commiphora abyssinica, which has several other names, to include Commiphora habessinica, myrrh tree, Arabian myrrh, and Yeman myrrh. The Hebrew word for myrrh is môr or môwr which means bitter, possibly because myrrh has a bitter taste (Strong, 2010). 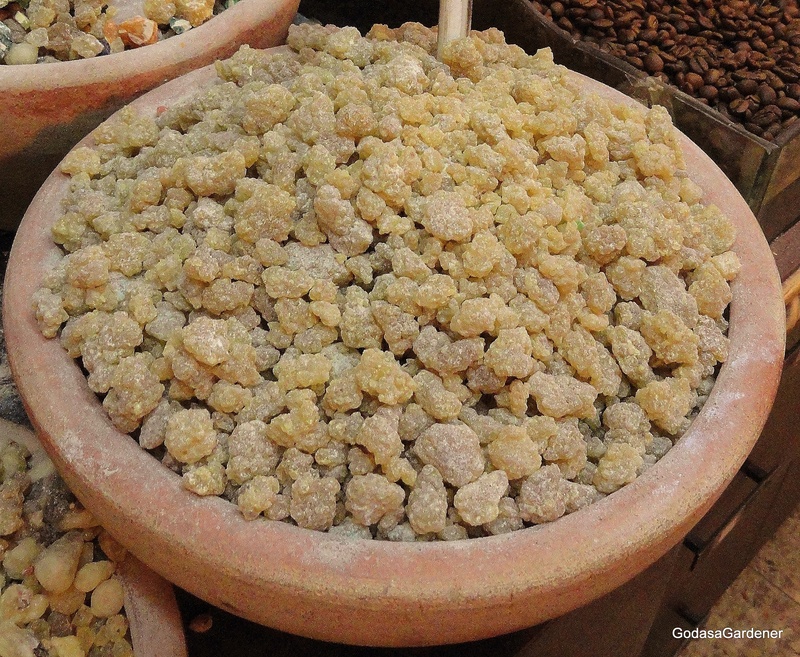 The Israeli myrrh was indigenous to Ethiopia or possibly Southern Arabia and Yemen. As early as 1900 B.C. caravans carried myrrh to Egypt where it was used in the embalming process. Around 1876-1880 B.C., Jacob described myrrh as one of the best products of Canaan and directed his sons to take myrrh to Egypt to trade for grain (Genesis 43:11-14). 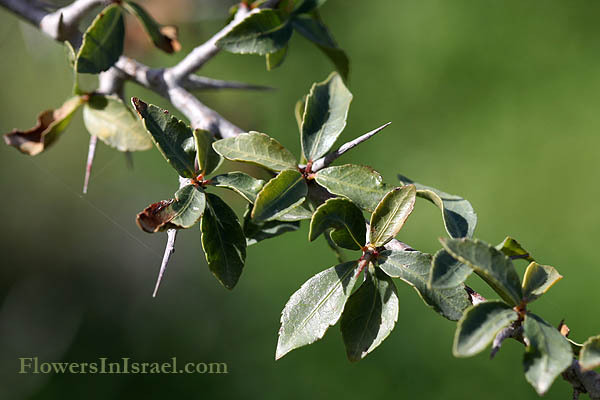 In present day Israel, the myrrh tree grows in the Biblical Landscape Reserve (Neot Kedumim). We saw myrrh in the bazaar in the old city of Jerusalem. The myrrh was in sharp-edged, marble-size pieces. Myrrh continues to be used today as sweet smelling incense for religious celebrations. By tradition, myrrh symbolized both death and gifts. Jesus dead body was wrapped in linen and myrrh. The wise men gave the gift of myrrh to the baby Jesus. According to the writer of Hebrews, the original gifts, animals, food, drink, that Israelites brought to the Tabernacle and Temples were not able to clear the conscience of worshipers (Hebrews 9:9-10). Although the gifts met Tabernacle and Temple regulations, they were only external regulations applied until the new order came. The new order was Jesus being sacrificed on the cross for sins. Christ gave his life as a gift for humankind. In turn, the gift that Christ wants from each of us is that we belief in him as risen Savior. When we belief in Christ as Savior, we accept God’s gift of his son and Christ’s gift of his life. Copyright: January 4, 2015. Carolyn A. Roth. All rights reserved.